We are proud to be featured partner of Headwrapz, the "Original" and highest quality of helmet wrap manufacturers in the country. After we were making high-end graphics for uniforms for a few years teams started asking us to design their helmets as well. We had been industry friends with the guys at Headwrapz for years and reached out to them to partner. Now we mock up custom designs for you for approval and let it to the professionals to deliver the end product. 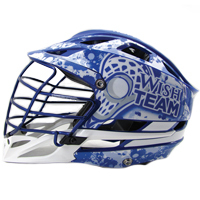 Call us today for more information on wraps for a variety of sport helmets. We can design a full wrap design that covers the top vents, skunk strips, visor, full side panels, and full rear panels.